R/GA London has developed a new way for Unilever's oral care brand Signal Pepsodent to tell a story that reaches parents and children around the world. 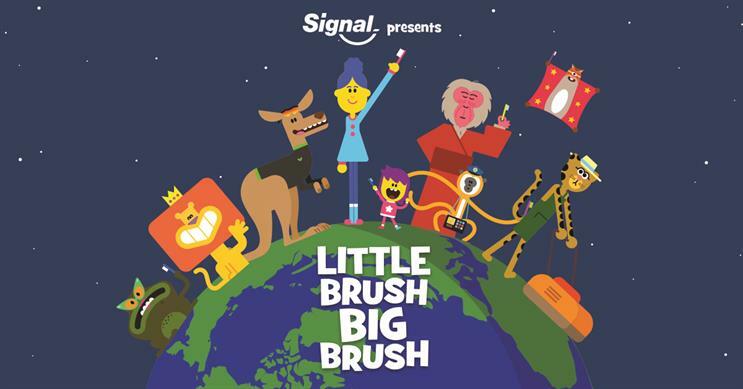 The free animated story, Little Brush, Big Brush, is delivered by Facebook Messenger in 21 episodes designed to be viewed over the same number of days. Unilever said it is intended to encourage parents and children to brush their teeth together and develop good brushing habits for life. Little Brush, Big Brush, which is customised by the chatbot around a child, tells the story of a family which is transported to a magical realm inhibited by quirky animal characters. To find their way home, the family must complete regular brushing challenges and users are encouraged to participate in the adventure. It can be delivered in an alternative SMS and voice call format for non-smartphone mobile users. The activity is set to roll out worldwide in time but is starting this month in Indonesia and Vietnam. These are two of Signal Pepsodent’s fastest-growing markets and also register lower than average daily brushing frequency. Anuj Rustagi, global brand director of Signal Pepsodent, said: "We are really proud of this fantastic piece of personalised communication. Research has shown that we can help to drive behavioral change with 21 episodes of Little Brush, Big Brush evening challenges, and that is something really meaningful." R/GA London was responsible for the concept, strategy, branding, design and prototyping of the messenger bot, as well as the user experience, creative direction and production oversight of the characters and animation development. Andrew Ferguson, group creative director for Unilever at R/GA London, said: "Building something that is both innovative and can truly help people live better lives, is exactly the type of work we thrive on creating." The campaign has already been integrated with Signal Pepsodent’s school programme to empower more children to spread the message of oral health within their families and communities.